Brutex is a shell based open source tool to make your work faster. It combines the power of Nmap, Hydra and DNSenum. 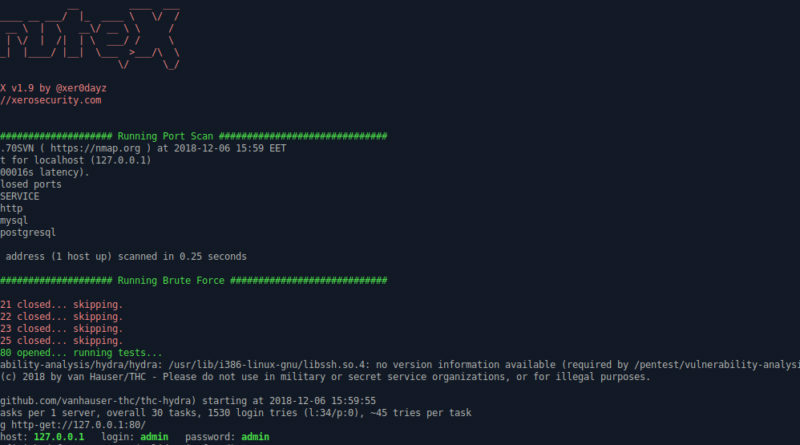 This tool will automatically run an nmap scan to your target and then it will brute force all the open services for you, such as FTP, SSH and more using Hydra. Same old story, clone the repository first. Run the install script, to download all the missing dependencies. Running the Brutex script, an interface appears with instructions on how to use the tool. From there, all you have to do is to type your target’s ip and the script will start to enumerate the network. After that, it will start to bruteforce all the open services in an order. If you want, you can add a port after the target’s ip and it will bruteforce only the specific service you chose. As we can see in the example below, I have ran the script against a vulnerable server of mine and found the username and password of an apache server. Okay I know pretty simple example but you get the point. Very easy to use it saves you time from your penetration testing. You can just run the script and leave it to bruteforce all the services for you, while in the meantime you can search for another way to get into your target. The only ‘problem’ is the success rate of the attack, using default wordlists. Overall, great tool, I am giving it 3,5 out of 5 bunnies. I am a penetration tester and cyber-security enthusiast. Passionate about everything around the hacking world. Find me on Linked-In.